Fiona's new album comes 7 years after her last one. 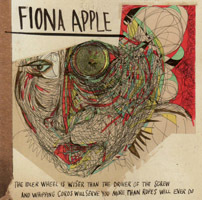 It's been a long wait and I had almost giving up on hearing a new Fiona Apple album ever again. Luckily it's been worth the wait. She has always been a woman with a love for long album titles and this time is no different "The Idler Wheel Is Wiser Than the Driver of the Screw and Whipping Cords Will Serve You More Than Ropes Will Ever Do." Fiona still sings her heart out while musically it is being totally stripped down when compared to her other albums. I'm not entirely sure if that's what I really would have preferred, but it can't take anything away from the great melodies, her piano playing or her fantastic voice. It's not exactly happy lyrics "How can I ask anyone to love me, when all I do is beg to be left alone", but you wouldn't expect that from Fiona, would you? "I could liken you to a werewolf, the way you left me for dead, but I admit, I provided a full moon." It may take several spins to really open up, but when you allow it to, it actually reveals itself as a really great album. My personal favourite is easily "Periphery" with it's weird instrumentation and simple repetitive piano, but all songs on the album sound 100% like Fiona and most of them are great songs. We can only hope we won't have to wait another 7 years for more of this. Even if most of the songs are dealing with heartbreaks and love gone wrong, at least the last song "Hot Knife" is more uplifting. "I'm a hot knife, I'm a hot knife, I'm a hot knife, he's a pat of butter. If I get a dance, I'm gonna show him that, he's never gonna need another, never need another."